Aaron McEneff celebrates his penalty against Finn Harps at Finn Park, Ballybofey on Friday night. Picture by Margaret McLaughlin. DERRY CITY leapfrogged Cork City into second spot in the table after the Candystripes put Finn Harps to the sword with a five star showing in Ballybofey. The Brandywell club, who meet the Rebels on Monday night on Foyleside, moved one point clear in second although John Caulfield’s men have three games in hand. It was a good night all round for Kenny Shiels’ troops with fourth placed Shamrock Rovers defeated by Sligo at the Showgrounds. An Aaron McEneff double from the penalty spot gave Derry a well deserved two goal cushion in the first half. And Nathan Boyle added a third from close range early in the second half to put the game beyond the Co. Donegal men. Derry weren’t finished yet and Lukas Schubert raced onto substitute, Keith Ward’s pass and shot beyond Richard Brush to make it four. And Ward finished the game off two minutes later when his delicate chip over Brush from 10 yards found the back of the net. 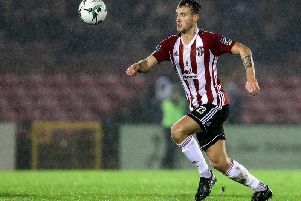 Derry City were boosted by the surprisingly inclusion of Dean Jarvis (foot), Conor McDermott (thigh) and skipper, Ryan McBride (groin) who all passed a pre-match fitness test. So Kenny Shiels’ pre-match talk about approaches to the FAI to postpone the fixture was clearly a ploy to gain an advantage over his opposite number. The Derry boss went with two up front for the first time of the season with Boyle joining Rory Patterson in attack. And it was Boyle who fashioned the opening chance of the game on nine minutes when he got on the end of an excellent Aaron McEneff pass but his low strike from the edge of the are went narrowly past the post. Five minutes later ex-City striker, Ryan Curran found himself in a promising position but scuffed his shot and Gerard Doherty saved comfortably. At the other end Lukas Schubert raced onto a long ball upfield, controlled it well and when he took the ball past Coll, the Harps wideman brought him crashing to the ground. The contact was just outside the box but the assistant referee waved his flag and match referee, Paul McLaughlin pointed to the spot. And Aaron McEneff calmly slotted home from the spotkick with 18 minutes on the clock. The impressive McDermott made a jinking run through the Harps defence just after the half hour mark but his attempt at a chip from 16 yards went harmlessly over. Schubert was again brought down recklessly inside the Harps area, this time by ex City skipper, Barry Molloy and again the match referee pointed to the spot. McEneff again took responsibility and netted his second of the game, sending Richard Brush the wrong way to make it 2-0 with 60 seconds to go before the interval. Harps started the second half positively but the visitors added a third on the break eight minutes after the restart. Niclas Vemmelund sent Jarvis scampering down the left wing and the City left back found Boyle superbly with his cut-back. And the striker steered his shot into the corner of the net confidently from eight yards. Harps substitutes, Adam Hanlon and Dave Scully combined for the Ballybofey men’s best chance of the night on 64 minutes. The latter found himself in space inside the Derry area but his shot was saved well by Gerard Doherty. Having earned two penalties on the night, Schubert raced through on goal with five minutes to go and his shot found the net despite the best attentions of Brush. And Ward ensured Derry’s biggest win of the season two minutes later when he got in behind the Harps defence and chipped the ball over the advancing Brush. Finn Harps: R. Brush; J. Mailey (R. Foy 62), P. Mailey, K. Cowan, T. McMonagle (D. Scully 57); E. Boyle, B. Molloy, T. McNamee (A. Hanlon 57), C. Coll; S. Houston; R. Curran; Subs Not Used - C. Gallagher, M. Funston, BJ Banda, A. Hanlon. Derry City: G. Doherty; C. McDermott, R. McBride, N. Vemmelund, D. Jarvis; L. Schubert, C. McDermott, A. McEneff, B. McNamee (K. Ward 76); N. Boyle (J. Daniels 69), R. Patterson; Subs Not Used - S. Patton, H Monaghan, J. Allen, B. Doherty, R. Curtis.